In last week's video we took a look at Microsoft (MSFT) from the perspective of a long-term shareholder. Lest you think that kind of track record is common, I wanted to contrast it with what is more commonly found among large publicly traded companies. Looking for a good comparison, I remembered watching "The Informant!" - a movie in which Matt Damon plays an FBI informant inside Archer Daniels Midland (ADM). ADM is a 100 year old behemoth of agribusiness. The company generates revenues of some $70 billion a year, processing soy and corn into oils and other food ingredients. And... it makes for a perfect case study. Despite remarkable scale and, presumably, market power, ADM has not done much for its shareholders over the past 15 years. The equity of common shareholders has been more or less flat from 1995 till 2004. There has been a modest 1.9x increase in the past 5 years, which works out to a reasonable 14% per year, but the overall record leaves much to be desired. As we saw with MSFT, before drawing conclusions from the equity charts, it is important to check whether the company has been returning wealth to its shareholders, which could explain a flat equity chart. Indeed, we find that ADM has been buying back its stock, and reduced the number of outstanding shares by about 10% since 1995. While commendable, this anti-dilutive policy does not fundamentally change the flat shareholder outlook. Of course, what lies behind this meager performance for shareholders is a commodity business in which high returns are hard to come by. The average return on equity (ROE) for ADM over the past 15 years stands at 9.5%, which is a bit below the average for the S&P 500. The average return on all assets (ROA) is at 4.2%. Would I want to be a shareholder of ADM, and have ADM deploy my equity in this way? Definitely not. Why would anybody possibly invest? Perhaps at a low enough price ADM could be attractive as a dividend stock. At the current price levels ($26), however, the annual dividend payouts ($0.56) mean a dividend yield of only 2% - not interesting. The optimists among you might observe that over the past 4-5 years ADM has been able to achieve ROE rates of above 15% - so there might be hope for improved performance. 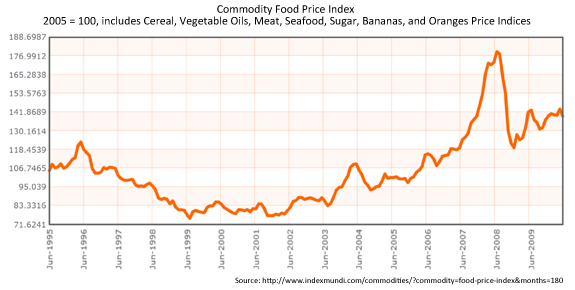 Unfortunately, it looks like ADM's ROE basically tracks the food commodity prices, which have been high recently. So, betting that ADM will continue earning decent returns is akin to speculating on commodities - not our game. This story of ADM illustrates the importance of looking at long-term historic records of shareholder performance. ADM may look like a good performer on a 4 year scale, however, once you expand your horizon to more than 10 years, a very different - and much less appealing - picture emerges. For this reason I try to bring you 15 to 20 years of data at stockPup.com. Since the goal of an investor should be finding companies that can consistently - and over long periods - generate high returns, ADM is not for us.